Provide each dog in the home his own safe place—preferably a crate or pen—where they can eat their meals or treats at their own pace, without bother from children or other pets. Take a few minutes at mealtime to teach your Basenji commands like “leave it” and “look at me” to facilitate easy redirection at other times. Teach your Basenji to wait to for invitation to join you on the sofa. If he jumps up without permission, eject him with a simple “Oops! Off, please.” When the dog jumps down, provide positive reinforcement for his obedience. “Thank you! Wait, please” and give him a treat. 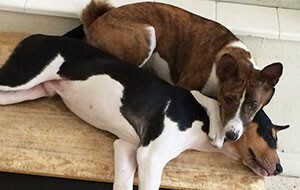 In multi-dog homes, sometimes there is one dog that guards or blocks stairs or doorways. This dog may nip at other dogs as they pass. We deal with this behavior by shifting the blocking dog’s focus from the area with distraction or play. Remember rule number one: when you observe resource guarding, distract and redirect the dog. If this fails to address the matter or the behavior reaches uncontrollable levels, contact a certified behaviorist or trainer. The sooner you make the call, the better.